Many of the things we will list under this tab are motivated by peer pressure and lack of understanding the danger. We would like to share these with you because it takes a village to raise a child. We will share topics we know about and please email us if you would like us to add a topic. Always be aware of where your family is in a swimming pool and how long they are under water. We want parents to know that while it seems harmless that children will compete againt each other to hold their breath the longest under water and let bubbles out slowly, that disrupts the body’s natural instinct to want to take a breath. Some common names for underwater breath hold play: Tea Party were children attempt to sit on the bottom of pool acting out a tea party staying under as long as possible. Another is Treasure Hunter and this one involves retrieving trinkets off the pool floor. (not many packs of pool toys that sink include any warning of prolonged breath hold) Again the longer the child is under the more treasure possibly collected and more dangerous the dive. During these and other games under water the urge to come up for air is ignored on purpose. This adds to the danger of passing out underwater. Since there is no struggle and no cry for help when a person passes out underwater this is often not noticed for several minutes and the person has sunk to botttom of pool unnoticed. If a person comes to surface disorientated or appears lethargic and lost after swimming under water then it is possible they are experiencing low oxygen level in blood stream. It is often “justified” as person being tired and needing rest. 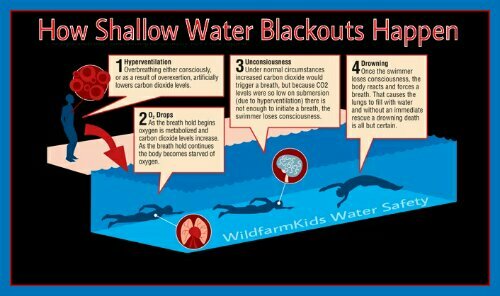 Please be aware Shallow Water Blackout can also happen in a lake, creek, river, ocean, water tank or even your bath tub. Any place where someone can hold their breath under water. Always be aware of the risk of someone holding breath under water. Drug and alcohol abuse among our youth is killing our teens, despite the fact that parents and school officials have the tools to help them. Overdoses are sometimes hidden by parents as other illnesses because they are embarrassed. This reinforces the youth’s belief that drug use is ok with parents and the parents will help the youth out of the trouble. We have to swallow our pride and help our children. Marijuana and K2 (synthetic marijuana) has a hold on our schools. I have seen 11 and 12-year-old students with those items on them at school. At that rate they come in to High School already addicted. Many parents have a hard time believing that their child, being that young, is addicted to illegal drugs. As a coping mechanism many parents deny it and make excuses for the behavior and relieve the child of their responsibility and the parents of their embarrassment and guilt. This behavior does not get the child help. We need to get our addicted youth into rehab and break the cycle as early as we can. The younger they are when we break the cycle the more chances of a successful life they will have. If we leave it up to our children to navigate through their youth with an addiction, we doom them to fail. We may end up with the worst and find them lifeless in their room one day. We may get a knock on the door from law enforcement who asks us to sit down before they give us the news. We may get a call from our child from jail that begins years worth of manslaughter court proceedings. We may get the news from our daughters that she is pregnant and has no idea who the father is. We must be the parents our children deserve. We must be the protectors they need. We are their heroes, lets save them. My daughter learned the Choking Game from friends but then was using it to cope with her stress like someone cutting themselves or taking drugs to cope. I don’t know if people are aware that this also can become a dangerous addiction. My daughter had told a friend what she was doing and luckily they told the school and after a year of not leaving her side and hospital programs she now wants to speak out to others. Yes, we have been told it becomes addictive and the youth build endurance and ‘chase’ the high; takes longer to get the adrenaline rush. The part the youth don’t undrstand is that that endurance can be altered by such a number of things and what took a minute to acomplish one day may only take a few seconds the next because of other activities and food they have had that day. Youth believe because it is nit illegal it must be okay or that since they were not told to ‘not’ do it they are being disobedient. Many adults We have spoken to have said it became part of their daily routine and only stopped when either they got hurt or could no longer get the desired results or most commonly became distracted by other activities. All were shocked in finding out it was deadly. Many knew that they could get hurt if the fell (concussion, bruises or broken bones) but all seemed to feel that ‘they’ were in control. Mist never understood the side effects were caused by what they were doing hours earlier. The reality of it is that they were lucky that they stopped before causing permanent damage or death. You may email wildfarmkids@aol.com for more information. Thank you for sharing your story and for all the advocating you and your family will do.